Boiler Operator’s Workbook provides an overview of the latest information on safe and efficient operation of both low and high pressure boilers and related equipment. This edition is a complete instructional resource to be used in preparing to pass a boiler operator’s license exam. All facets of steam boiler operation, maintenance, and troubleshooting are covered. Boiler Operator’s Workbook has been updated with new technologies used with boilers, such as variable-frequency motor drives, PLC controls, low-NOx burners, rifled boiler tubes, reverse osmosis systems, thermal fluid power boilers, gas turbines,and co-generation. The appendix has been expanded to include more tables of useful information and more boiler formulas which serve as a summary and review of common boiler operation calculations. To purchase now, click here. 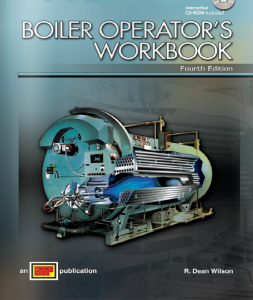 Boiler Operator’s Workbook is available as an eTextbook on CourseSmart.com.